This week I want to talk about the time I was blindfolded, handcuffed and led into a room by a very friendly female game master. Now, before you think bad thoughts (you gutter-minded pigs… lol), I want to say I was with my fiance, two friends and two women whom I had never met before. OK… I don’t think that helped my case any. Would it help if I said I was then cuffed to a bench while a video played that I couldn’t see, since I was blindfolded? No… guess not. Trust me, there is a review here, just give me time to get to it. A few weeks ago, my fiance and I had a double date with some really close friends. We decided to head down to Franklin, TN and check out Breakout Nashville. We had already reserved the game and had chosen to try out the game called “Hostage.” On the hour drive from Hendersonville to the venue, we plotted how we would tackle this game. We didn’t have much to go on, other than we were going to be handcuffed and placed in a room. And being that I was the only one of the group who had done an escape game, I decided to give my patented hints and tips on how to succeed, even though my record was 0-1 (hey… a natural-born leader leads, even if it is in the wrong direction). So, we arrived about 20 minutes before our scheduled time. We entered the lobby and were greeted by the receptionist. She had us fill out the waivers and told us that since our game room was set for six players, we would have two more people joining us. What a way to destroy all the planning and conceptualizing we had done the previous 60 minutes! I knew it was possible, but I had no way of telling the strangers beforehand what their roles in the room were going to be. Breakout Nashville had, in one sentence, ruined by day (I hope my sarcasm is coming through). About five minutes later, our companions arrived. As soon as they were done with the signings, we were ushered into the back, where all the game rooms are located. The game master had us line up to enter the room. Naturally, I jumped at the chance to be the first in the room. We were issued our blindfolds and told to put them on. Then, with my hand on the GM’s shoulder, we were led into the room, backed up to the bench and handcuffed. I must say, it was kinda unnerving and set the mood of the storyline perfectly. With my senses heightened, my blood pumping and heart racing, the game began. While on a flight, your plane is hijacked and you lose consciousness as the cabin depressurizes. Later, you wake up and realize you’re trapped, handcuffed to your friends, in the hijackers’ headquarters. Can you lose your handcuffs, find out the details behind their hijacking and escape before time’s up? (Pulled directly from Breakout Nashville’s website). As always, I won’t give away any of the exact mechanics of the game. The game takes place in only one room, which, while not my preferred gaming experience, worked in this case. There were lots of distraction objects in the room, used to lead you down dead ends. It took us a while to get the ball rolling, actually. Our two new friends had some issues getting out of their cuffs, which already made me concerned about our chances of “surviving” before our kidnappers returned. But after a couple of minutes, my fiance actually found the first major clue in the room and from there, we were off to the races. All of the puzzles fit perfectly with them, however, I felt that a certain puzzle mechanic was used way too many times. I am a fan of having multiple puzzles to have to solve, but when you had the same type of puzzle to do, just at different phases, it started to feel a little boring. Our team worked our way through the puzzles, stumbling and bumbling our way through. We screamed for all three of our clues, and each one immediately helped us solve the puzzle we were on. With only 10 minutes left, we had to ask for a fourth clue, which immediately added time to our clock, meaning we had even less time. But, the final clue gave us the last thing we needed to find the key code to exit. It was exhilarating to punch in the code, turn the knob and have the bright LED lights around the door turn on, meaning we had completed the challenge!! I must say, Breakout Nashville’s Hostage is a very fun game. The GM said the completion percentage was around 20 percent, which added to the feeling of accomplishment for all of us. As I mentioned earlier, there were some puzzles in the room that felt recycled and I would have preferred to have many different types of mind traps to unwind. The lobby around the game rooms could also use some updates. Instead of a boring waiting room, maybe adding some artwork to the walls or something would spice things up. Your lobby is the first thing people see, so it needs to start the experience off right. But everything else about the venue and room was completely acceptable in my book. I give Hostage at Breakout Nashville 4/5 stars. With some minor tweaks, I think the game could easily become a 5, as it is fun and challenging. 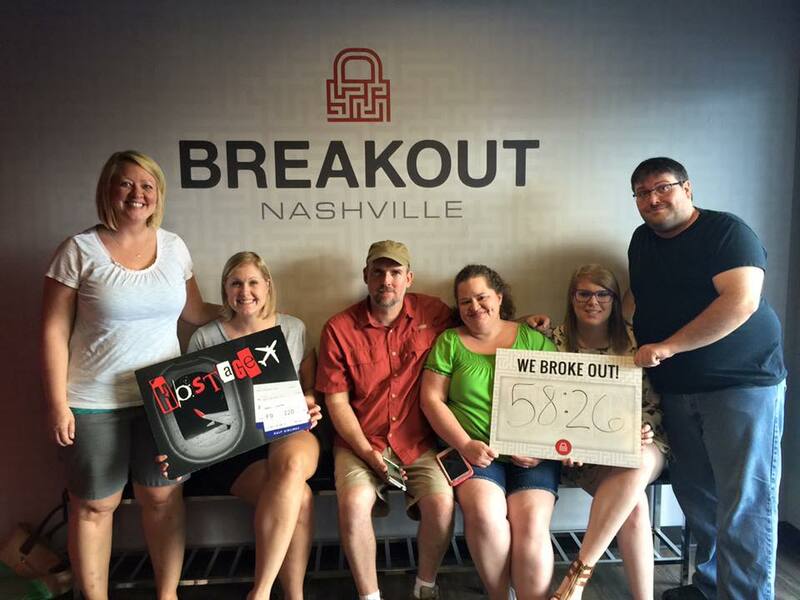 Keep up the great work, Breakout Nashville! I will be back to play again.